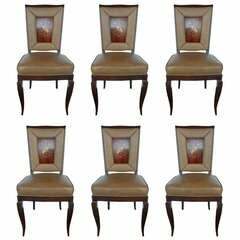 Elegant brass Italian nautical theme side or dining chairs in the manner of Gio Ponti. The backrest has 2 anchor crossbars with a ship wheel motif in the center. The metal seat is reminiscent of the texture used by Mathieu Mategot in his designs. Set of six elegant Italian wrought iron stylized ladder back chairs with blue/green ultra suede seats. The chairs are in the style of Gio Ponti, circa 1960. 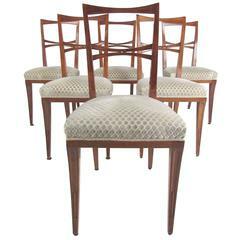 2 elegant side chairs in the manner of Gio Ponti. Wood frame, tapered legs and burgundy velvet backrest and seat. Perfect desk or occasional chairs. Three Gio Ponti 'Leggera' chairs with a grey upholstery and a smooth wooden frame. The backrest is characteristically bent at the top. Ponti for singer set of 6 dining chairs model 116 bleached walnut with reupholstered seats and backs Great plains cotton weave. 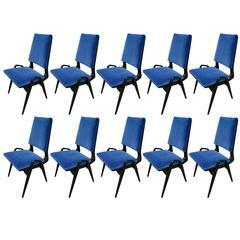 Set of ten 1960s dining chairs in the style of Gio Ponti upholstered in cobalt blue velvet with unique legs. Beautiful original 'Leggera' dining chair by Gio Ponti. Ashwood and cane.